Editor’s note: This article is an exerpt from EBRI Employee Benefit Research Institute Issue Brief, November. 2015, NO. 420 . Spending is one of the crucial economic factors in retirement, so it is very important to understand the spending patterns of retired households and the causes that drive their spending behavior. Understanding spending patterns not only will help current retirees succeed, but it will also help policymakers, employers, financial firms, and advisors assist current workers to have a successful retirement. This report attempts to quantify how household spending changes in the immediate years following retirement. Banerjee (2012, 2014) has shown that spending declines for retired households as they age. Those age trends in spending have been derived from cross-sectional samples, but this study has used panel data to track the changes in retirement spending for a fixed group of households. On the other hand, Aguila, Attanasio, and Meghir (2011) find that non-durable consumption remains unchanged at retirement, so they conclude that there is no evidence of a retirement consumption puzzle. Hurd and Rohwedder (2008) report small declines in household consumption over retirement and argue that these changes are compatible with the life-cycle model. This report does not make any attempt to test the validity of the life-cycle model; rather, using more recent and higher-quality data, it documents the spending changes that U.S. households actually make in the years following retirement. Results clearly show that overall average and median household spending does decline in retirement, although some households experience increased spending as well. Two sources of data are used for this study. First is the Health and Retirement Study (HRS), which is a study of a nationally representative sample of U.S. households with individuals over age 50. It is the most comprehensive survey of older Americans in the nation and covers topics such as health, assets, income, and labor-force status in detail. It is a biennial longitudinal survey with questionnaire waves in even-numbered years beginning in 1992. The initial sample consisted of individuals born between 1931 and 1941 and their spouses, regardless of their birth year. Newer cohorts have been added in the following years. The study is sponsored by the National Institute on Aging (NIA) and the Social Security Administration (SSA) and administered by the Institute for Social Research (ISR) at the University of Michigan. The labor-force status of the respondents is used from HRS for this report. The other source of data is the Consumption and Activities Mail Survey (CAMS), which was started in 2001 as a supplement to the HRS. From the participants in the 2000 HRS, 5,000 households were selected at random and mailed the CAMS questionnaire. In couple households, the questionnaire was sent randomly to one of the two spouses. Since 2001, CAMS has been conducted every two years, with 2013 the latest round of available data. CAMS contains detailed household spending information. This study uses the RAND version of the CAMS, which combines the data across all survey years into a user-friendly format and is easier to use for longitudinal analysis. Hurd and Rohwedder (2008) also use data from the first three rounds (2001, 2003 and 2005) of CAMS for their study. However, CAMS 2001 and 2003 has fewer spending categories than the later survey years, and as a result, total spending is not comparable across waves. For this reason, Hurd et. al. (2015) suggest in the RAND CAMS Data Documentation that “For research purposes that are sensitive to changes in spending at the household level, researchers should consider limiting their analyses to CAMS Waves 2005 onward.” For this reason, this report uses CAMS data from 2005 through 2013. One of the problematic aspects of the report is the categorization of “retired households.” There is no set definition for a retired household and retirement can be fluid. People can go back to work for pay, even after they have “retired.” The issue is compounded for couple households with both spouses working. The study uses CAMS data for the years 2005, 2007, 2009, 2011, and 2013. Households have to be observed at least once before retirement, so only households that retired in 2006 or after are included in the sample. 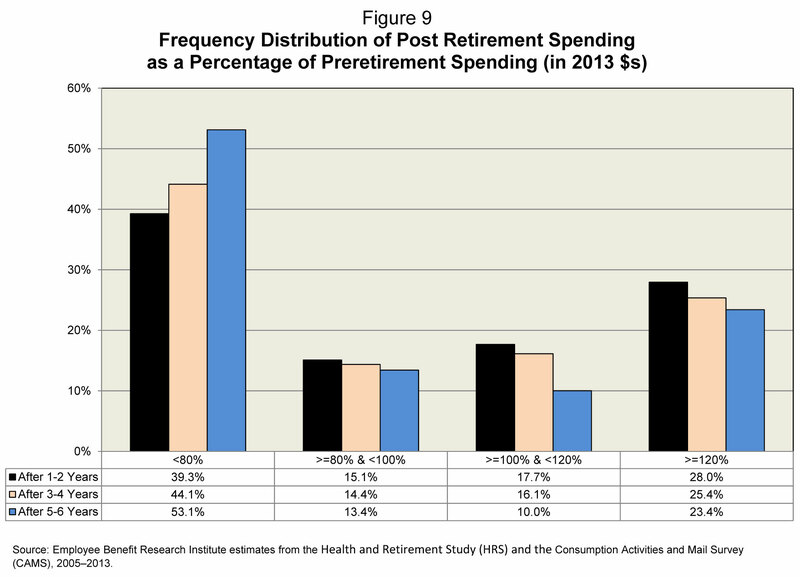 Their preretirement spending corresponds to the last household spending observed before the household was deemed retired. Post- retirement households are observed after one to two years, three to four years, and five to six years. Also, if the marital status of any household changes after retirement then the household is dropped from the sample at that point, because changing marital status can affect the spending levels of the household. This method allows the same group of households to be analyzed over time (longitudinally), which is a major advantage data. Figure 1A shows the change in total household spending in the years following retirement. Both average and median (midpoint) spending levels are reported. The preretirement average and median household spending are $56,006 and $46,452, respectively. After one to two years of retirement, the average drops to $51,721 and the median drops to $43,901. So, in the first two years of retirement, average household spending drops by 7.7 percent and median household spending drops by 5.5 percent. The decline in average household spending continues in the following years. By the sixth year of retirement, average household spending ($47,766) drops by 14.7 percent and median household spending ($39,888) drops by 14.1 percent. But these reductions slow down after the fourth year of retirement. For example, by the fourth year of retirement, average spending drops by 13.6 percent of preretirement spending, which means the additional drop in the fifth to sixth year is only 1.1 percentage points. Similarly, for median spending, the spending falls quickly at first and then slows down. Figure 1B shows Figure 1A by marital status. The general trend of a steady decline over the first six years of retirement is present for both couples and singles. For couples, the median household spending drops by 10.3 percent (from $54,626 to $48,982) in the first two years and by 16.0 percent (from $54,626 to $45,872) by the sixth year of retirement. For singles, the respective drops are 11.8 percent (from $29,842 to $26,328) and 19.0 percent (from$2 9,842 to $24,153). So singles show slightly higher spending drops than couples in percentage terms. 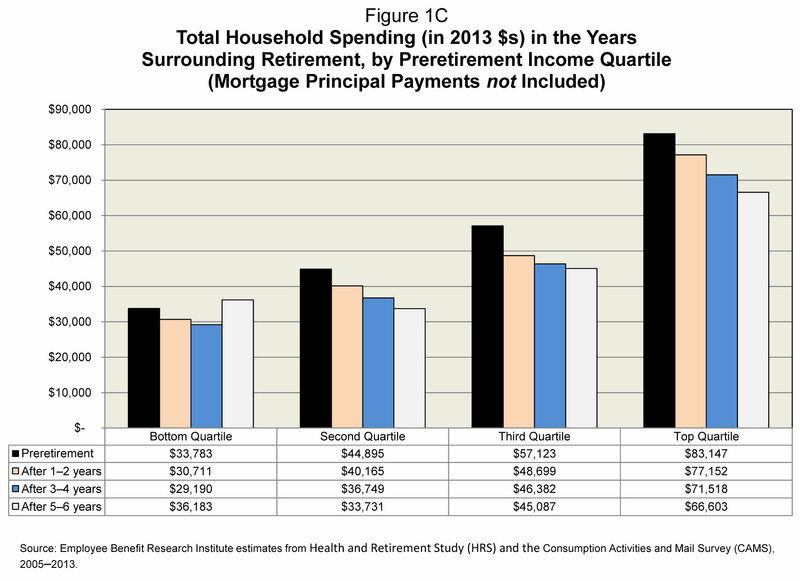 Figure 1C shows Figure 1A by household preretirement-income quartiles. The steady drop in retirement spending can be seen in almost all income groups, although the bottom-income quartile shows an increase in spending after five to six years of retirement. For the top-income quartile, household spending drops by 7.2 percent in the first two years after retirement (from $83,147 to $77,152) and 19.9 percent by the sixth year of retirement. Durable spending consists of only five durable goods—and, appropriately, the median expenditure is zero both before and after retirement. 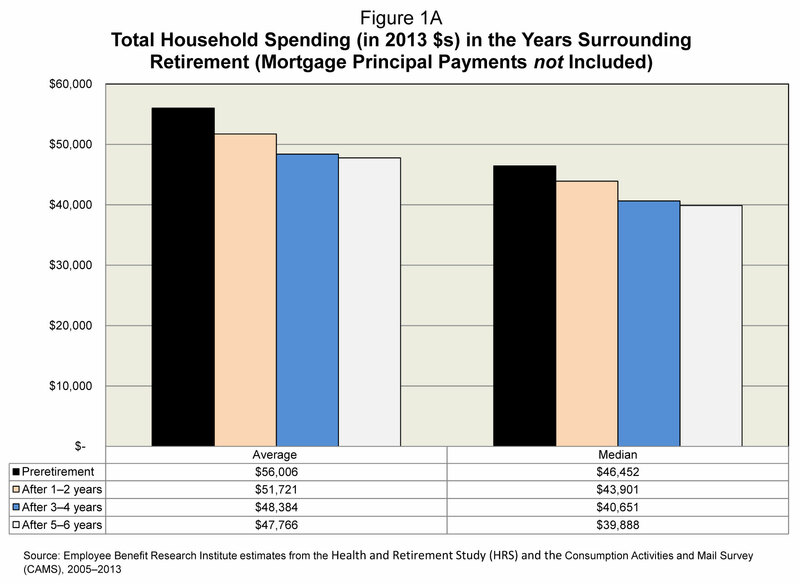 The average goes down in retirement, but by either measure, durables constitute a very small portion of total spending. As might be expected, durable spending is higher for higher-income groups. Durable spending broadly goes down for all income groups as households enter retirement, although there are slight increases in the fifth or sixth years of retirement for the bottom half of the income distribution. Non-durables constitute the bulk of the spending and the declines in this category are in line with the decline in total spending—although slightly higher in percentage terms. For example, in the first two years of retirement, median non-durable spending goes down by 6.3 percent (from $23,881 to $22,378). By the sixth year of retirement, median non-durable spending is down 17.4 percent (from $23,881 to $19,737), and average non-durable spending is down 16.5 percent (from $29,817 to $24,885). Transportation spending shows the highest spending reduction in the first two years of retirement. This is expected, since commuting to and from work constitutes the bulk of transportation expenses for most people. Average transportation spending drops from $13,671 to $10,745 (a 21.4 percent drop) in the first two years of retirement, while median transportation spending drops from $7,193 to $5,387 (a 25.1 percent decline) during the same period. The subsequent drops in transportation spending are small. 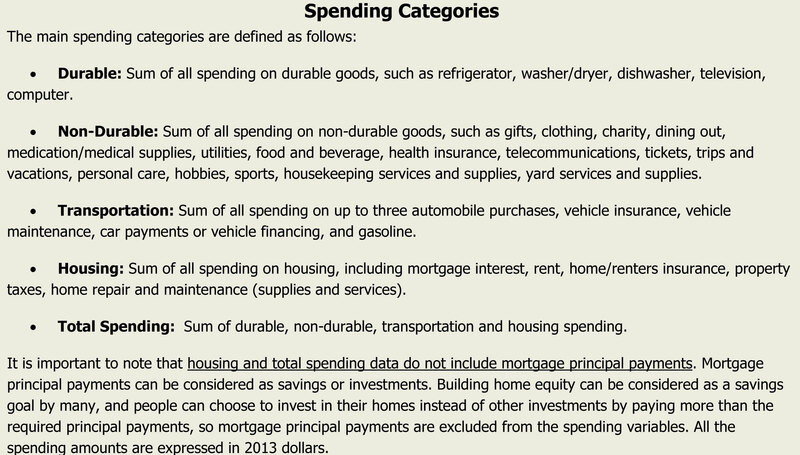 The final set of spending is on housing, which, as noted earlier, excludes mortgage principal payments. Median spending on housing during the first two years of retirement drops from $9,070 to $7,800 (a 14.0 percent drop) and to $6,167 by the sixth year (a 32.0 percent drop). Although this report does not consider mortgage principal payments as spending (hence those payments are not included in housing or total spending) for the reasons mentioned above, some people may still view the payments as an expense, since they have to write a check every month to their mortgage lender. Consequently, it would help to know how much households with a mortgage are paying down in mortgage principal (and therefore gaining in equity) in retirement. 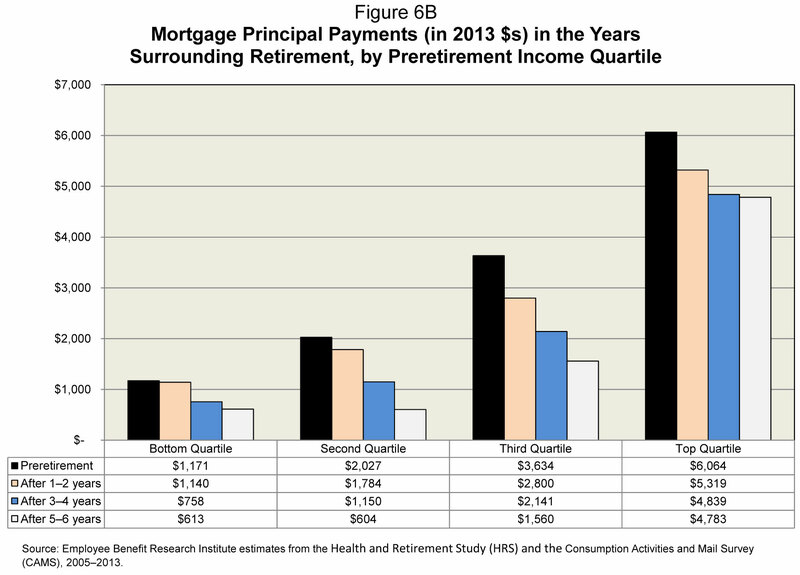 The median payment on mortgage principal is $2,198 preretirement, but drops to zero after retirement. Figure 6B shows the change in average principal payments by income quartiles. Payments go down for all income groups as households move into retirement. Not surprisingly, payments are higher for higher-income groups. Although average spending goes down in retirement, that does not mean every household experiences a drop in spending as they enter retirement. For some, expenses may not change at all, and for some they may even increase. During the first two years of retirement, 45.9 percent of households actually spent more than their preretirement levels. This number goes down as they move deeper into retirement: After three to four years in retirement, more than 2 in 5 households (41.5 percent) spent more than their preretirement levels. After five to six years in retirement, 1 in 3 households (33.4 percent) still spent more than their preretirement levels. But it is not necessarily the case that the same households spent more than their preretirement levels in all those years. A possible explanation for this could be that people may want to splurge as they enter retirement by traveling or spending on their hobbies. If such spending were a function of income, it might be expected that those who spent more than their preretirement levels are concentrated at the top of the income distribution. That is not the case. The first-, second-, third-, and fourth-income quartiles spend percent, 49.5 percent, 45.8 percent, and 45.4 percent more than their preretirement income, respectively. This indicates that households that experience higher spending immediately following retirement are spread across the entire income distribution. Among those who spend less, it is also not clear how much less they spend in retirement. Figure 9 makes an attempt to address this. Post-retirement spending is expressed as a percentage of preretirement spending and divided into four bands : less than 80 percent of preretirement spending (Band I); more than or equal to 80 percent of preretirement spending but less than 100 percent of preretirement spending (Band II); more than or equal to 100 percent of preretirement spending but less than 120 percent of preretirement spending (Band III); and more than or equal to 120 percent of preretirement spending (Band IV). Figure 9 shows that within the first two years of retirement, almost 2 in 5 households (39.3 percent) spend less than 80 percent of their preretirement levels. As they move deeper into retirement, more and more households enter Band I. By the sixth year of retirement, a majority of households (53.1 percent) are in Band I. On the other side, in the first two years of retirement 28.0 percent of households spend more than 120 percent of their preretirement levels (Band IV). But the numbers of household go down as the years in retirement go up. Nevertheless, after five or six years in retirement close to 1 in 4 households (23.4 percent) are in Band IV. There are significant percentages of households in the middle two bands, but their numbers go down as their time in retirement goes up. Consequently, a lot of households (46.9 percent) spend more than 80 percent of their preretirement levels even after five or six years in retirement, even though the trend predicts that their numbers go down with more years spent in retirement. A person’s financial success of retirement depends on two key components—savings accumulated during working years, and spending during retirement years. Quantifying these two components and the underlying behavior patterns is essential to understanding how people are likely to succeed in retirement. This report focuses on spending in retirement by documenting how household spending changes in the years immediately following retirement and analyzing the spending patterns of a fixed group of households up to six years after their retirement. Household spending dropped at the beginning of retirement. Median household spending dropped 5.5 percent of preretirement spending in the first two years of retirement and 12.5 percent by the third or fourth year, after which the decline slowed down. Although average spending in retirement fell, a large percentage of households experienced higher spending following retirement. In the first two years of retirement, 45.9 percent of households spent more than what they had spent just before retirement. By the sixth year of retirement, this fell to 33.4 percent. In the first two years of retirement, 2 in 5 households (39.3 percent) spent less than 80 percent of their preretirement spending. By the sixth year of retirement a majority (53.1 percent) of households did so. In the first two years of retirement, 28.0 percent of households spent more than 120 percent of their preretirement levels. By the sixth year of retirement 23.4 percent of households did so. A very small percentage of the average household budget was spent on durable goods; the median household spent nothing on durables in retirement. Transportation accounted for the largest drop in spending during the first two years of retirement. Median spending on transportation went down by 25.1 percent in the first two years of retirement, although spending cuts in subsequent years were small. 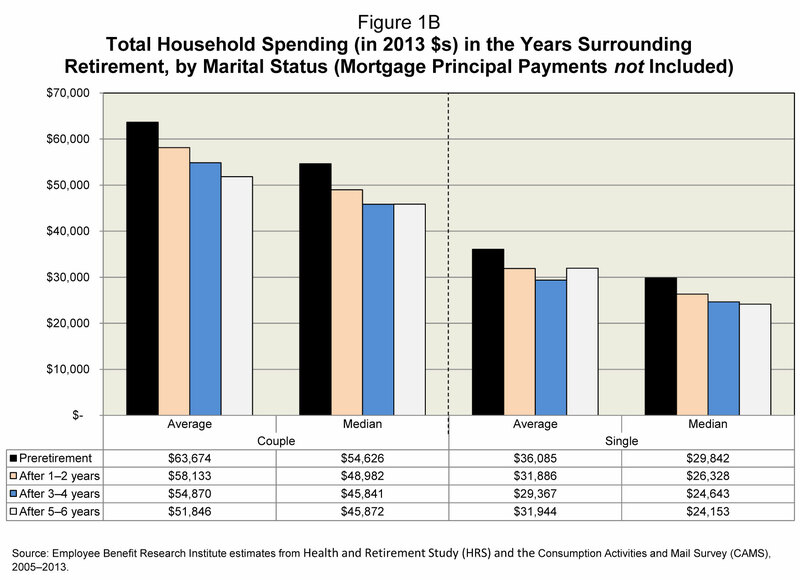 The median household had a mortgage payment before retirement but none after retirement. Aguila, Emma, Orazio Attanasio, and Costas Meghir. “Changes in consumption at retirement: Evidence from panel data.” Review of Economics and Statistics, 2011, 93(3), pp. 1094-1099. 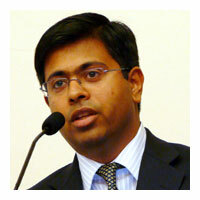 Banerjee, Sudipto. “Expenditure Patterns of Older Americans, 2001‒2009.” EBRI Issue Brief, no. 68 (Employee Benefit Research Institute, 2012). “How Does Household Expenditure Change with Age for Older Americans?” EBRI Notes, Vol. 35, no. 9 (Employee Benefit Research Institute, 2014). Banks, James, Richard Blundell and Sarah Tanner. “Is There a Retirement-Savings Puzzle?” American Economic Review, 1998, 88 (4), pp. 769-788. Bernheim, B. Douglas, Jonathan Skinner and Steven Weinberg. “What Accounts for the Variation in Retirement Wealth among U.S. Households?” American Economic Review, 2001, 91 (4), pp. 832-857. Hurd, Michael, and Susan Rohwedder. “The Retirement Consumption Puzzle: Actual Spending Change in Panel Data.” NBER Working Paper No. 13929, 2008. Hurd, Michael, Susann Rohwedder, Joanna Carroll, Joshua Mallett, Colleen McCullough. RAND CAMS Data Documentation, 2015, Version D, Release 2, p. 11. The Employee Benefit Research Institute (EBRI) was founded in 1978. Its mission is to contribute to, to encourage, and to enhance the development of sound employee benefit programs and sound public policy through objective research and education. 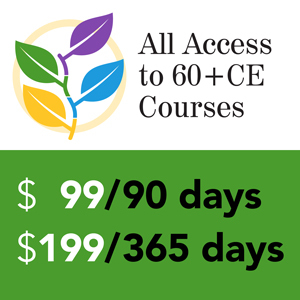 EBRI is the only private, nonprofit, nonpartisan, Washington, DC-based organization committed exclusively to public policy research and education on economic security and employee benefit issues. EBRI’s membership includes a cross-section of pension funds; businesses; trade associations; labor unions; health care providers and insurers; government organizations; and service firms. EBRI’s work advances knowledge and understanding of employee benefits and their importance to the nation’s economy among policymakers, the news media, and the public. 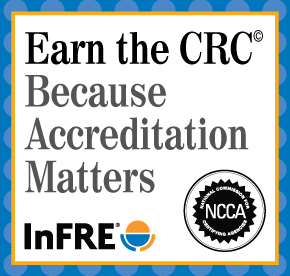 It does this by conducting and publishing policy research, analysis, and special reports on employee benefit issues; holding educational briefings for EBRI members, congressional and federal agency staff, and the news media; and sponsoring public opinion surveys on employee benefit issues. EBRI’s Education and Research Fund (EBRI-ERF) performs the charitable, educational, and scientific functions of the Institute. EBRI-ERF is a tax-exempt organization supported by contributions and grants. EBRI Employee Benefit Research Institute Issue Brief (ISSN 0887137X) is published monthly by the Employee Benefit Research Institute, 1100 13th St. NW, Suite 878, Washington, DC, 20005-4051. Copyright 2015 by Employee Benefit Research Institute. All rights reserved. No. 420. Used with permission. 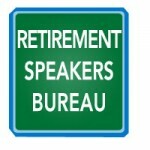 Are you looking for a retirement speaker for your next conference, consumer event or internal professional development program? 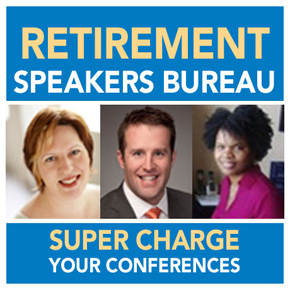 Visit the Retirement Speakers Bureau to find leading retirement industry speakers, authors, trainers and professional development experts who can address your audience’s needs and budget.